“Charles Kullman was one of the first American singers to establish a career in Europe before returning to his home country in triumph. His successes in Berlin, Vienna, Salzburg and London, and his work with such conductors as Otto Klemperer, Bruno Walter and Arturo Toscanini made it possible for him to join the Metropolitan, where he sang a remarkably varied repertory in 402 performances - 283 in New York, 119 on tour - between 1935 and 1960. Although never one of the greatest opera stars - in part because his international career was hindered in its prime by World War II - Mr. Kullman was a deeply respected artist. In the late ‘20s there was hardly any domestic circuit for young American singers. Mr. Kullman did tour for a season with Vladimir Rosing's pioneering, English-language American Opera Company, but realized that his best hope for success was to establish a European career. Mr. Kullman auditioned in Berlin for Klemperer, who at that time was director of the Kroll Opera, the experimental wing of the Berlin State Opera. He made his début with the Kroll as Pinkerton in Puccini's MADAMA BUTTERFLY on 24 Feb., 1931. The Kroll Opera shut down at the end of that season, but Mr. Kullman was taken on by the State Opera proper, where he sang until 1936. His tenure in Berlin was cut short by his defiance of a Nazi ban on German-based singers appearing at the Salzburg Festival in Austria, where Toscanini and Walter were attempting to establish an anti-Fascist counterweight to the German summer festivals. Mr. Kullman, who was now singing regularly in Vienna, as well, performed often with those conductors, including Walter's first recording of Mahler's DAS LIED VON DER ERDE and Toscanini's famous productions of Beethoven's FIDELIO and Verdi's FALSTAFF at Salzburg. 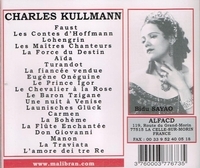 Mr. Kullman's Met début took place on 20 Dec., 1935, in the title role of Gounod's FAUST.